Radius of a single lamp. All types of available lamp colors. The lamp is a basic electric device providing light to a medium area (10 tile radius) at night. It can be used to increase visibility in a factory, so nightvision is not needed. Lamp colors can be changed. The can be done by sending a color signal to the lamp. When the condition inside the lamp passes, instead of lighting up white, it will use that color. This can be used to create colored displays, or indicate status. If more than one color signal is received, precedence is given to them in the order below (i.e. if red and green are received, the lamp will light red). As of now, attempting to use grey or black signals will just have the lamp's light show up as white, making those signal colors somewhat useless. Colored lamps illuminate only to a 1.5 tile radius. 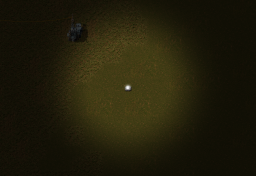 Changed default value of "lights render resolution" graphics option to 0.25. This can be increased at the cost of performance. Implemented lamp colors based on received signal. Circuit network conditions can be copy and pasted between lamps. The lamp can be connected to the circuit network. Reduced slowdowns when drawing many lights. This page was last edited on 23 March 2019, at 22:36.